Kate Di Prima - Dietitian: Run out of time for breakfast?.......I think not!! Run out of time for breakfast?.......I think not!! 3 of my clients yesterday said they are simply running out of time for breakfast! By the time the kids are fed, lunches made, morning jobs done and some where in there getting ready for work- not to mention the quick 5.30 am run or 1/2 hour walk for exercise..............no time left to refuel. There is no excuse for not having breakfast even if it is grabbing a piece of fresh fruit or a tub of yoghurt before you dash out the door. It still astounds me that there is a percentage of kids that head off to school without breakfast! 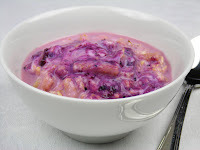 One of my favourite summer breakfasts is bircher muesli. Preparing it the night before and adding a few dollops of yoghurt the next day makes it quick, easy and tasty. My kids love the soft texture and taste using varieties of flavoured low fat yoghurt. Enjoy the last day of school, mums and dads!!! !